Abstract: We present PhoneEar, a new approach that enables mobile devices to understand the broadcasted audio and sounds that we hear every day using existing infrastructure. PhoneEar audio streams are embedded with sound-encoded data using nearly inaudible high frequencies. Mobile devices then listen for messages in the sounds around us, taking actions to ensure we don’t miss any important info. In this paper, we detail our implementation of PhoneEar, describe a study demonstrating that mobile devices can effectively receive sound-based data, and describe the results of a user study that shows that embedding data in sounds is not detrimental to sound quality. 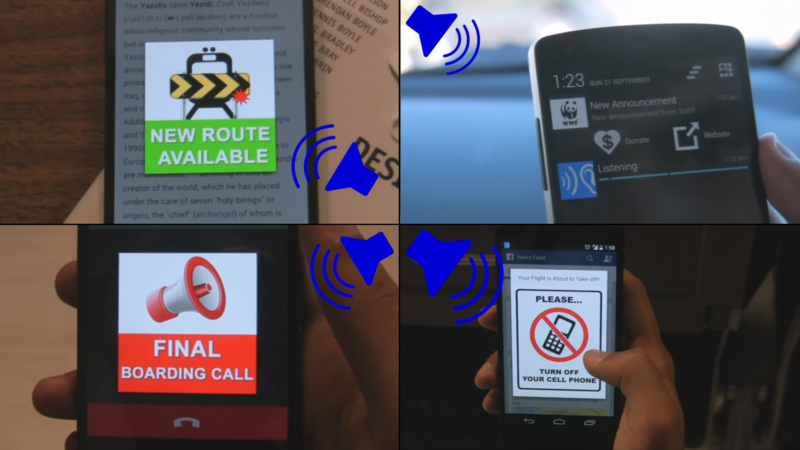 We also exemplify the space of new interactions, through four PhoneEar-enabled applications. Finally, we discuss the challenges to deploying apps that can hear and react to data in the sounds around us. SA. S. Nittala, X-D. Yang, S. Bateman, E. Sharlin and S. Greenberg, “PhoneEar: Interactions for Mobile Devices that Hear High-Frequency Sound-Encoded Data” , Proceedings of 7th ACM SIGCHI Symposium on Engineering Interactive Computing Systems (EICS'15). 2015. Duisburg, Germany.